Hungarian filmmaker Arpád Bogdan sets out to discover what's behind the new wave of anti-Roma sentiment in Hungary today. Film director Arpád Bogdan took a fateful step, looking for his gypsy roots for the Life 6 series. Should he now stay in touch with his newfound family? And how should he react to the current political threats that face other Roma populations in Hungary today? 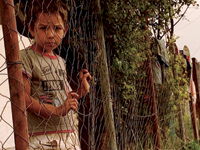 Hungary's fragile economy was badly hit by the economic crisis in the fall of 2008, with growing social tensions leading to a spate of horrific attacks on gypsy families. This episode of Life 8 follows Arpád as he sets out to discover what's behind the new wave of anti-Roma sentiment in Hungary. Arpád is convinced that only social change and greater acceptance will allay Roma fears.